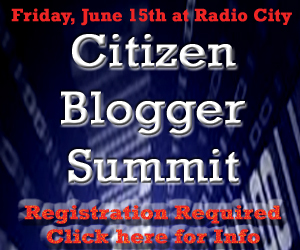 Somehow I got roped into participating in this Citizen Blogging Summit (or “Citizen Blogger Summit”) which is taking place Friday, June 15th, 2007. Maybe Newsradio 620 WTMJ will learn a little about blogging, you know, things like permalinks, or even linking to the bloggers you invite, instead of just putting their domain in plain text. I’m really not sure what to expect. Mike Rohde and I are on the 2:25-3:10 Panel, Beyond Politics, Beyond Milwaukee. I’m guessing we are the ‘tech bloggers’ or maybe the token ‘non-political’ bloggers. Anyway, I’ll just prepare for this the same way I prepare for BarCamp or Web414 presentations, wait until the last minute, attempt to do nothing, then embrace the chaos. Posted on Tuesday, June 12th, 2007 at 9:00 am. Subscribe to the comments feed. Both comments and pings are currently closed. Post on your own blog. I have no idea if it will be broadcast… I hope so. I wonder if this will be recorded for later broadcast and/or podcast. I heard that TMJ is doing on location stuff at Lakefront Festival of the Arts on Friday, so that leads me to believe it will be recorded and not live broadcast. I’ll email TMJ and see what they say. The event will be videotaped for podcasting. Be careful, your words will live in perpetuity.